Taking a cue from Toyota’s playbook, Hyundai’s Genesis cars will become their own luxury brand. A leaked presentation has confirmed what we previously reported about the Genesis future lineup, and now we have vehicle names and a tentative timeline. 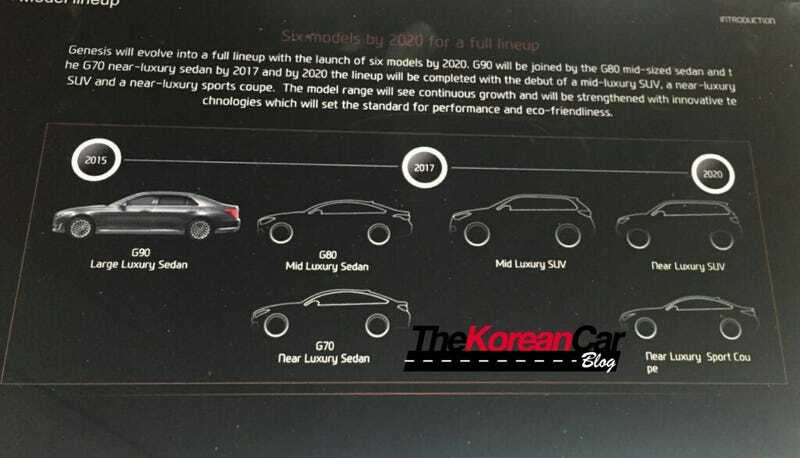 The Korean Car Blog was able to get an image from a product presentation which shows the Genesis product road-map for the next three years. We already know about the G90, otherwise known as the EQ900, that will be an updated version of the full-size Equus. The G80 will soon replace the current Genesis mid-size sedan and it appears that the brand is going to go after the hyper-competitive entry level sedan segment with the G70. Hyundai refers to this segment as “near luxury,” which seems like an appropriate term for a new brand that doesn’t yet have the name recognition like the other tier-1 luxury automakers. Sometime between 2017-2018 Genesis will launch a mid-size luxury crossover, which could possibly be based on the Santa Fe platform that can comes in both 2-row and 3-row configurations. This would give Genesis a player to go up against popular sellers such as the Lexus RX and Acura MDX, which despite all of your burning hatred for those things still sell like hotcakes. Hotcakes are still a thing that sell, right? Anyway, around 2020 Genesis is planning a compact crossover (near luxury) that could come from the Tuscon. Given how hot well small luxury crossovers sell, it does seem odd to postpone such a vehicle. Genesis is probably just trying to establish itself with some larger models first before aiming for entry level crowd. Within this same time frame, a “near luxury” sports coupe is also in the works possibly based on the G70 compact sedan and will replace the current Genesis coupe. Hyundai corporate has been poaching some serious talent from the Germans to pull this Genesis brand together. Breaking into the luxury car market on a large scale is a difficult task. However, Hyundai already has some of the highest loyalty among mainstream automakers. The Genesis brand, if well executed, could be an opportunity to push those returning customers up market. We’ve reached out to Hyundai and will update if they want to confirm all of this or anything.